On Tuesday I went to Stratford-upon-Avon looking forward to a peak behind the scenes at the new Royal Shakespeare Theatre but came back buzzing with excitement about our RSC Open Stages project. (And the theatre was quite exciting too!) Open Stages grew out of discussions between Voluntary Arts and the Royal Shakespeare Company about how best to involve amateur theatre in the 2012 World Shakespeare Festival (part of the London 2012 Cultural Olympiad). After a planning weekend involving 65 representatives of voluntary arts umbrella bodies, in Stratford in November 2009, Open Stages began to take shape as stand-alone project, funded by The Esmee Fairbairn Foundation. Ian Wainwright was appointed as the RSC’s Open Stages Producer in August 2010 and Ian has been working closely with Voluntary Arts and the amateur theatre umbrella bodies to develop the project. At the end of 2010 we invited applications from amateur groups and I can now reveal that 300 amateur productions across the UK have been chosen to be part of RSC Open Stages. These 300 amateur groups, who are creating productions of Shakespeare plays or Shakespeare-related performances, will be branded and marketed by the RSC and will be invited to take-part in a series of 10 regional and national skills-sharing weekends run by the RSC and 10 partner professional theatres. Within each region and nation, several amateur productions will be chosen to be showcased at the partner theatres in Spring 2012 and 10 of these will go forward to perform in Stratford in July 2012 as part of the official World Shakespeare Festival, alongside the RSC’s own productions and professional companies from across the world. The 300 amateur RSC Open Stages productions include performances in forests, castles and stately homes, performances by the John Lewis Partnership amateur dramatics group and by a RAF theatre group involving service personnel just returned from Afghanistan. The response to our call for applications was far in excess of our expectations and Open Stages looks like being a wonderful national celebration of amateur Shakespeare. Ian and I were joined on Tuesday by Tabitha Allum, the Chief Executive of Stagetext, to discuss the use of captioning for the hard of hearing by amateur theatre groups. We agreed to offer all the groups involved in Open Stages the opportunity to receive training from Stagetext in how to introduce live captioning to their performances. More details of RSC Open Stages at http://www.rsc.org.uk/explore/projects/open-stages/ and lots of discussion at http://www.facebook.com/rscopenstages. On Tuesday afternoon I met Fiona Dodd, the author of the 2008 DCMS/Arts Council England research report ‘Our Creative Talent: the voluntary and amateur arts in England’. Fiona, a consultant with the firm TBR, based in Newcastle, was keen to hear what effect ‘Our Creative Talent’ had had with DCMS and ACE since its launch at our conference at The Barbican in July 2008. I updated her on the progress of the Amateur Arts Partnership Development Programme – a steering group involving Voluntary Arts, DCMS and ACE which met regularly from 2008-10 to follow-up the recommendations and conclusions of ‘Our Creative Talent’. I talked about the tangible achievements of this programme such as the regular Amateur Arts Forum meetings at which senior ACE staff now meet representatives of voluntary arts umbrella bodies several times a year. I also explained how the Amateur Arts Partnership Development Programme had led to the references to the amateur arts sector in ACE’s 10-year strategy ‘Achieving Great Art for Everyone’, published in 2010, which included the commitment : “we will champion the value of the commercial, amateur and voluntary arts sectors in encouraging people to take part in the arts”. This commitment, in turn, has now led to ACE deciding that the funding agreements for its new National Portfolio Organisations will include a requirement relating to each organisation’s relationship with the amateur arts sector. Looking back to 2008, it is clear that ‘Our Creative Talent’ marked a turning point in Arts Council England’s commitment to working with the amateur arts sector. It was good to be reminded of what we have achieved on the back of ‘Our Creative Talent’. On Thursday afternoon I attended a meeting of the European Year of Volunteering 2011 working group at the Cabinet Office. We heard presentations from v – the lead body for the Children and Young People theme within EYV11 – and from Volunteering England who have been appointed to lead on sharing learning from the EYV11 programme in England. 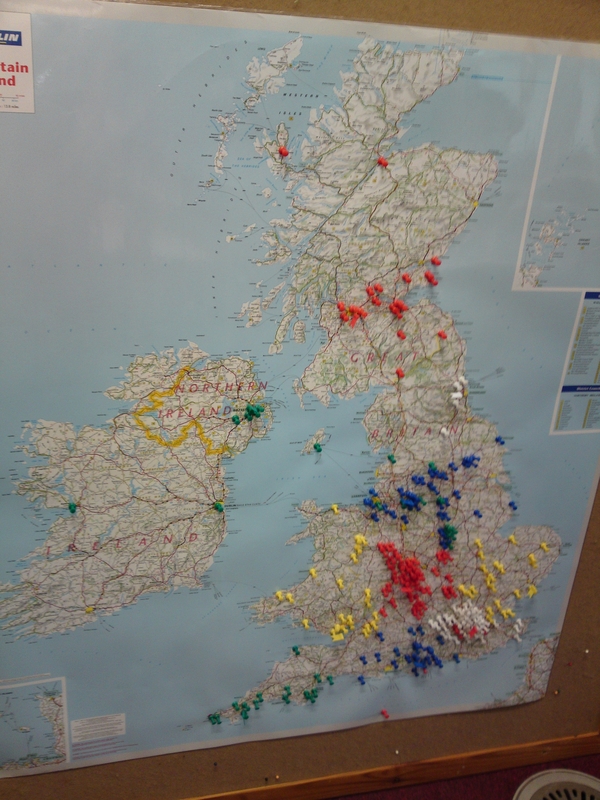 We also had an update on EYV11 activities in Scotland, Wales and Northern Ireland. I was in London on Thursday to see Steve Darke at the Department for Culture, Media and Sport. We talked about the Arts Council England National Portfolio Funding decisions, Epic Awards, Ed Vaizey’s plans to map the range of arts charities in England and possible changes to licensing legislation.